Anthropologists invented cultural relativism. Founding figures of American anthropology, Franz Boas and Ruth Benedict, the latter in her famous pre-war book Patterns of Culture, argued that you can only understand other peoples' lives if you consider their cultures and their actions from their own points of view. In the latter decades of the 20th century, the idea of cultural relativism was expanded to moral or ethical relativism. As we have our own values, and other people have different ones, no one being on neutral ground, the argument goes, on what basis can we pass judgment on the beliefs or actions of those in another culture? Every judgment is cultural. From this perspective, ethical judgment being culturally-based and thus inapplicable cross-culturally, every value or practice must be seen as good as every other practice. There is no way that we can judge some better or worse. Judgment of other cultures and those in them must be suspended entirely. There are no objective, non-cultural criteria to allow us to decide whether giving a widow a pension is better or worse than burning her alive on the pyre of her dead husband. The shift from individuals to collectivities is a major transformation of Western political philosophy. 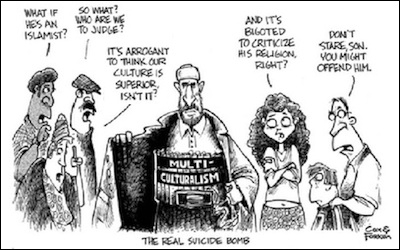 Cultural relativism has been built into public policy through "multiculturalism," the official policy of Canada and the unofficial policy of many European countries. Multiculturalism is often thought of as the opposite of assimilation; that is, multiculturalism allows immigrants to live in their own culture, with their own values, rules, and customs. Cultural communities, rather than individual citizens, would be the operative units of society. The shift from individuals to collectivities is a major transformation of Western political philosophy, with people being judged not on their individual merits, but on the characteristics of their community. However, there is an alternative, assimilationist understanding of multiculturalism, one that is held, according to repeated polls, by a large majority of the Canadian population: we welcome people from all cultures to come to Canada and adopt Canadian ways. In the case of multiculturalism, Canadian common sense is on firmer ground than collectivist multicultural political philosophers, for multiculturalism is an incoherent concept. A culture is a distinct way of life; different cultures are distinct ways of life. For people to live together in society, they must at least to a degree share a common culture. An obvious example is language; people must be able to communicate in a common language. The previous Conservative Government of Canada advised immigrants that, whatever the laws, customs, and practices of their countries and cultures of origin, they must obey Canadian law. For example, "honor" killings of family members, regarded as proper in cultures of the Middle East and South Asia, are not acceptable in Canada. 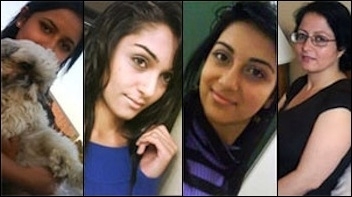 Three members of the Afghan Shafia family of Montreal were recently convicted of murdering four female family members who they deemed to have been insufficiently modest, or too Canadian. We are urged by champions of multiculturalism to acknowledge that each immigrant cultural community has a right to pursue its vision, values, customs, and practices. So increasingly public institutions, such as the Toronto schools, are providing space and time for Friday prayers, with girls required to sit in the back, and menstruating girls excluded altogether. Demands in Ontario for Sharia family courts enforced by the state were almost instituted by the provincial government, but for a clamorous public opposition by an informal group of young Muslim women. Should we recognize the right of South Asian families to force marriages to insure that the caste hierarchy is respected? Recently two South Asians in British Columbia were convicted of murder of the daughter of one of them, having killed in retaliation for marriage to a man of an "inappropriate" caste. Is forced marriage acceptable as the custom of a cultural community? Are hierarchies of purity, as in the caste system, acceptable in North America? The exact nature of American and Canadian values is rightly subject to debate. But American and Canadian values support individual freedom over community dictates, representative democracy over traditional despotism, individual achievement over hereditary status, equality over hierarchy, laws from legislatures over those in sacred texts, science over traditional knowledge, gender equality over gender hierarchy, respect for sexual diversity over repression. Will we bow to multiculturalism and accept collectivism, despotism, hereditary status, hierarchy, religious law, anti-scientific traditional knowledge, gender hierarchy, and repression of sexual diversity? The most important idea countering relativism and multiculturalism is human rights, as elaborated in the Universal Declaration of Human Rights. The position of human rights is an absolute one, arguing that everyone has certain rights by virtue of being a human being, irrespective of their origin or cultural community. Incoming immigrants and their cultural communities should be measured in their practices by the standards of UDHR.